You are here: Home > News > Heritage Angel Awards NI 2019. Now Open for Entries! 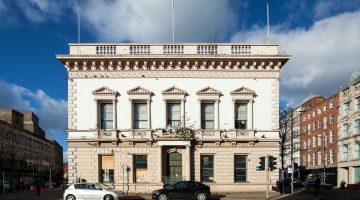 Heritage Angel Awards NI is funded by the Andrew Lloyd Webber Foundation and Armagh City, Banbridge and Craigavon Borough Council (ABC Council) is administered by the Ulster Architectural Heritage. The Awards seek to celebrate the efforts of people who go to extraordinary lengths to protect, save and share their local heritage. They also recognise those who champion heritage by sharing and practising forgotten craft skills. In addition they celebrate young people, recognising their efforts to learn about heritage. It has been running annually in Northern Ireland since 2017. Margaret Gallagher, winner of the 2018 Best Heritage Research, Interpretation or Recording category spoke at both events and relayed her surprise and joy at winning. She stressed the importance of the awards for local people and outlined the positive affects her win had made which included increased interest in the subject of heritage, demonstrated by the number of phone calls and letters she received from the public following her success. Since the awards Margaret has also been successful in receiving assistance with renovations to her 200 year old cottage from the Department for Communities, Historic Environment Fund. Singer songwriters Brigid O’Neill and Anthony Toner sang their bespoke compositions about buildings of Belfast and Derry/Londonderry originally performed for the 2017 and 2018 Heritage Angel Awards NI ceremonies. Giving a taste of what we might expect from the October Awards Ceremony and celebration of heritage in Northern Ireland. Nominations and applications are now open at www.heritageangelawards-ni.org.uk and will close on Friday 31st May. 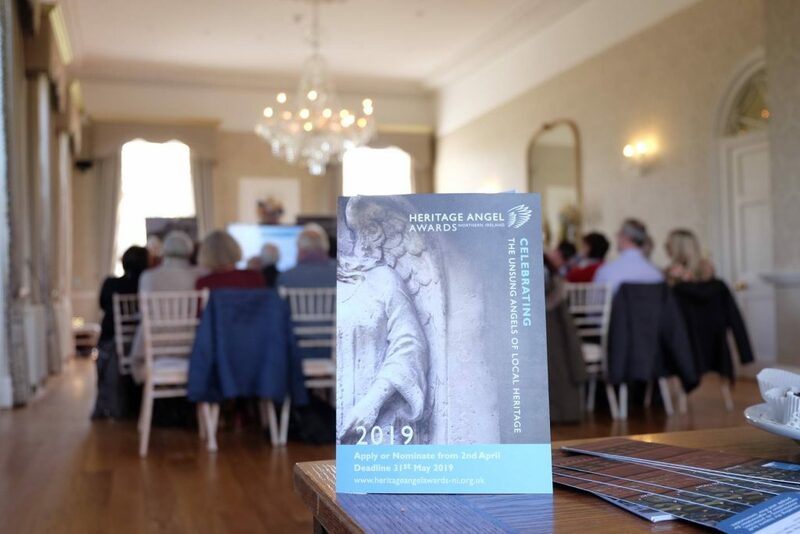 A team of heritage experts will have the tough task of whittling down shortlists for each category and a panel of judges will choose the eventual winners who will be announced at the Heritage Angels Awards NI ceremony on Tuesday 29th October in the Market Place Theatre, Armagh. 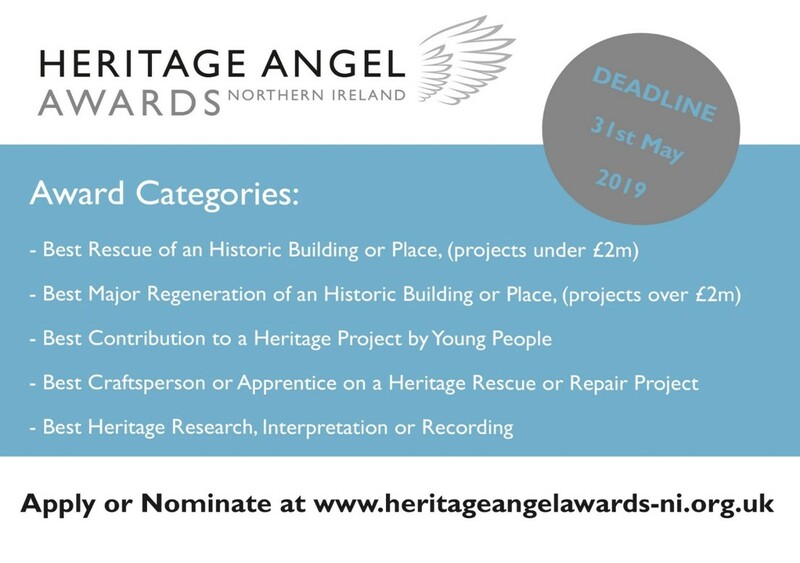 For full details on how to apply to the 2019 Heritage Angel Awards NI or nominate someone else for an award please visit www.heritageangelawards-ni.org.uk/ UAH will be holding roadshow information events, further details to follow. Keep up to date with the latest from the Heritage Angel Awards NI here and on UAH Twitter and Facebook.